The Teyyam and Mudiettu of Kerala also come under the category of trance dance. The elements of theater are so pronounced in them that they are considered forms of ritual theatre. In Indian performing art traditions, theatre and dance are inseparable. Kathakali of Kerala is generally regarded as a form of classical dance, but if it is examined carefully one will come to the conclusion that it is basically a theatre. The difference between a group dance and theatre is that while the former may have narrative elements as theme, the latter has a definite plot and gradual development of character along the story line, which Kathakali has. Plays are specially written for Kathakali and they are called atta-kathas. In Manipuri Raasa dances Krishna while dancing with the Gopikas, suddenly vanish. Gopikas are heart broken. Krishna finally comes back and performs the raasa dances with the Gopikas. It is not a plot. It is a theme which is narrative in character. Considering from this perspective, one may say that Mudiettu has a plot of how the goddess Kali vanquishes the demon Darika in a fight. But the Teyyam does not have a definite plot. There are, of course, narrative elements which are quite dramatic. 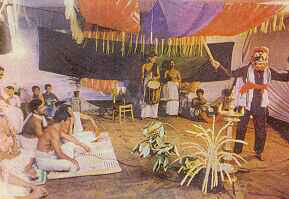 Therefore, we will consider Teyyam more a dance than a theatre. Teyyam is derived from the word daivam meaning god. Each of the dancers is possessed either by a god or by an exalted legendary hero. Teyyam is widely in vogue in North Kerala, particularly in Cannanore district. When the dancer wears the full make-up and costume he is called a Teyyam. 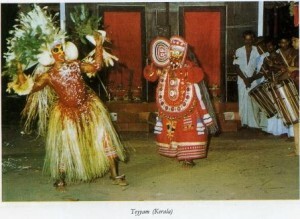 The make-up and costume, which are highly stylized, differ according to the Teyyam the dancer is required to represent. There are about 150 Teyyam in the traditional repertoire. The face of the dancer is given a mask like make-up with different bright colors. Each wear a towering and colorful headgear. At times, the headgear may be several feet high. The skirt is usually heavily pleated silk cloth. The dancers also wear many kinds of decorations made off tender fronds of coconut. The Teyyam with all these and heavy bangles and garlands appear much larger-than-life. After donning the costume the Teyyam goes through a ritual during which the invocatory chanting called Tottam is sung. This is for invoking the particular deity to enter into the body of the dancer. The dancer then executes some dance movements in slow tempo. Gradually the tempo becomes faster and faster and becomes a frenzied dancing leading to the trance. Trance dances are becoming weaker day by day. It is so because the mind of the dancer at times is not that impression-able as the values of industrial civilization are creeping in to weaken the strength of the faith he had earlier for the deities. Keeping the dance movements and connected things quite authentic the dancer may, at times, feign the trance part of it. Tirayattam is a fascinating form of ritual dance of Kerala. According to local myths Bhagavati, the mother-goddess and Lord Shiva take various incarnations to terminate the demonic forces. The dancers impersonate the various incarnations of the god and goddess. When a dancer wears the complete highly stylized make-up and equally colorful costume, he is called by the generic name of kolam. Some of the Shaivite kolams are : Bhairavan, Ghantakaran, Kayatan, etc. Some of the Bhagavati kolams are : Bhadrakali, Bhairavi, Odakali, Rakteshvari, etc. Each important kolam is presented by in 3 stages of development. The childhood phase when presented by a kolam it is called Vellattam. The phase of old age is called Chantattam. The most important phase is the youth which is known as Tirayattam. Before the Tirayattam begins there is a musical prologue. The music of drums and cymbals which is played first is called Tayambaka. Next comes the Kuzhalpoot music of the reeled pipes after which the Tirayattam begins. It is a dance form which has powerful dramatic elements. Yatrakali is performed by some of the sub-groups of Brahmins who are slightly lower in rank in the hierarchy of caste system. The dance is known through various other names like Sanghakah, Shastrakali, Chattirakali, Panankali etc. Many kinds of martial movements and exercises of Kalaripayettu are performed in this dance. Oachirakali is another dance in which mass mock combat is performed. The dance is named after the village named Oachira which has the temple of Lord Parabrahma. A five-day festival is is held every year around the middle of June. The festival is quite popular and thousands attend it either as spectators or as worshipers. It is believed that if worship is done here childlessness and a score of diseases will be cured. Several troupes of Oachirakali come to perform during the festival. Each troupe has a leader and the dance is performed to the leader’s verbal commands called Vayttari. The commands are in the form of nonsensical syllables which the dancers repeat loudly and perform the set movements. The group mock fight is the enactment of a legendary war. According to a local legend Kayamkulam Raja, a medieval ruler of the kingdom in which Oachira village is located, fought a battle with the then king of Tranvancore. The dance is re-enactment of that battle. In the Alleppey district of southern Kerala, the Nair community traditionally perform the Velakali dance. It is generally performed at the time of temple festivals held from March to May. But the most important and impressive performance of the dance is presented at the time of the ten-day Utsavam festival held in honor of Lord Padmanabhaswami of Thiruvantapuram. Some hereditary families of the Nair community have exclusive rights to perform in front of the temple at the time of Utsavam which is held in the lunar month of Phalguna corresponding to March/April. 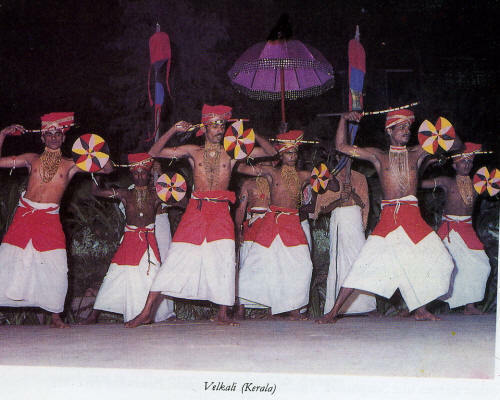 Velakali is customarily danced under the supervision of Mathu Pamkkar. Before the dancing begins, a flourish of trumpets and kettle-drums gives the call. The dance has elements of theater, since it depicts the fight between the Kauravas and Pandavas of the epic poem Mahabharata. The dancers represent the Kauravas. The Pandavas are represented not by men but by dummy figures. The dancers dance around these dummies flourishing the sword and shield held in their hands. The symbolic fight lasts for about an hour during which the dancers dance and jump vigorously around the dummies. Since the Pandavas were the victors, the dancers at the end of the dance retreat hastily to the steps of the temple. This kind of enactment is riot done in front of smaller temples in the district of Alleppy. There, the dance does not have the grandeur of the Velakali performed in Thiruvantapuram.